You’re young. Yesterday was a cold rainy day, and, against all the warnings you received from your teachers and guardians, you decided to go out and splash around. Now you are sick in bed with the sniffles and a high fever. What is the go-to food? Soup. We have all had soup in our lives, but most of us probably haven’t made 60 to 70 gallons of it at a time. 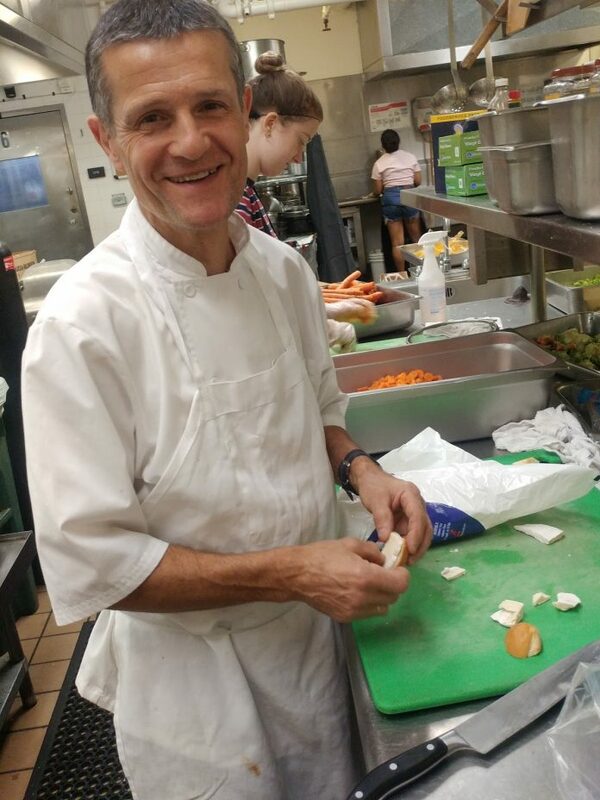 Bernard Gayraud, or as most students might know him, the Soup Guy, has been making both vegetable and protein soups for UCen Dining Services for the past year at just that rate. Soups that come out of the Central Kitchen range from Peruvian stew, roasted cauliflower corn coconut curry, and (my personal favorite) watermelon gazpacho. Those names are definitely a mouthful. What many students and faculty don’t realize, however, is that beyond the delicious soup, Gayraud has a delectable history. He decided he wanted to become a chef from a young age, so when he had the chance to, he studied to receive an associate’s degree in hospitality — which explains why he is so generous to all the students he works with. Students simply come to Gayraud with an open mind, a willingness to work hard, and a curiosity of what it means to be a cook. That’s what Gayraud enjoys most about his experiences and interactions with students. Beyond his full-time job as the Soup Guy, Gayraud expresses his creativity in things other than culinary arts. He enjoys painting and is self-taught, but like the rest of us he gets bogged down with unavoidable domestic house work. Being a fan of art, it is questionable why he would move to California from France. He came to California in 2013 because he felt he needed a change in his life, and between the wine and the food, Gayraud believes it is one of the best states in terms of produce and culinary arts. That status, he said, is largely due to the “whole organic movement and the ability for the market to be at different places each week at different times.” He acknowledged that this was largely due to the amazing West Coast climate. Before his move to the Golden State (20 years ago to be exact), he owned his own restaurant. He felt that owning a restaurant limited him, though, in his ability to enjoy and experiment with the act of cooking. Gayraud’s progression as a cook after selling his restaurant has been one that moved toward using fresher vegetables, meats, and ingredients. Other than that, though, he feels all that has changed is the environment, the students, and his attitude toward cooking. Gayraud feels that the community here at UCSB is a positive one and is very proud to be here. Outside of the kitchen, he puts on soup workshops with the Food, Nutrition, and Basic Skills program a few times a quarter. His personal favorite soup would be anything from his childhood in France; lamb and leeks seem to be some of his preferred ingredients. “It’s very gratifying … when you end up seeing what you did with your hands, it is pretty cool,” Gayraud said.